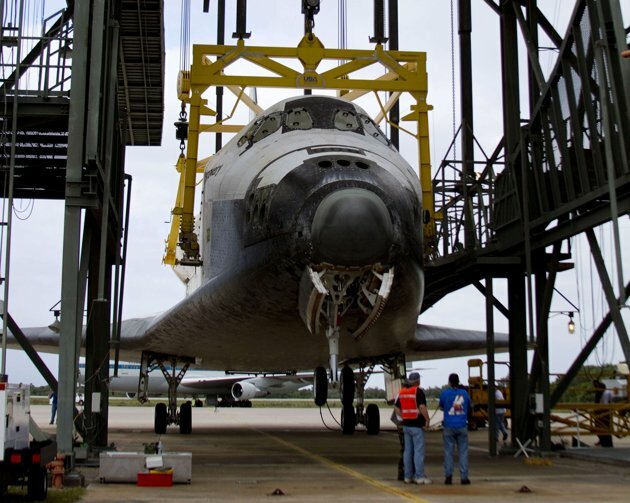 Space shuttle prepped for final flight, How NASA Moves Space Shuttles: The Ultimate Piggyback Ride, Discovery, which flew its last mission in 2011, will ride atop a special 747 jet to its final home. NASA's space shuttles are gearing up to make their final voyages — this time flying piggyback a special Boeing 747 jet on the way to museum retirement homes. The space shuttle Discovery, which flew its last mission in March 2011, has been undergoing prep for museum life at the Kennedy Space Center (KSC) in Cape Canaveral, Fla. If weather permits, on Tuesday (April 17), Discovery will fly atop a modified Boeing jet to the Smithsonian National Air and Space Museum's Stephen F. Udvar-Hazy Center in Chantilly, Va., where it will spend the rest of its days. After Discovery arrives at the Smithsonian, the museum's current orbiter on display, the prototype shuttle Enterprise, will be loaded onto the same carrier aircraft to be ferried to its new home: the Intrepid Sea, Air and Space Museum in New York City. The transportation of shuttles is a complicated affair, involving giant cranes and rejiggered Boeing jets. And in addition to a slew of complex equipment, the maneuver requires significant manpower. "The team is just amazing,"Dorothy Rasco manager of Space Shuttle Program Transition and Retirement at Houston's Johnson Space Center, told SPACE.com. "When you think of the pilot that will be flying the Shuttle Carrier Aircraft, to the ferry manager, to coordinating with FAA and the different Air Force and military facilities between Florida, Washington, D.C. and then to New York," Rasco said. "We've had different meetings with airport operations at different airports to make sure the security is appropriate. We’ve had outreach and communications efforts that make up the non-technical side. And then you have the whole technical team that has just pulled together to choreograph it. It's going to be really great." On Saturday (April 14), Discovery is set to roll out from the Vehicle Assembly Building, the 52-story building where it's gone through recent processing, to the Shuttle Landing Facility, the expansive runway where space shuttles touch down when they land at KSC. Here, the Shuttle Carrier Aircraft, the modified 747 jet that will carry it across the country, will be waiting. To load the shuttle onto the jet, NASA uses a giant gantry-like machine called the Mate-Demate device. This contraption uses two 100-foot steel towers with a massive lift beam in between them to hoist the orbiter off the ground. Once Discovery is lifted in the air by the Mate-Demate device, the Shuttle Carrier Aircraft will roll beneath it, positioning itself under the belly of the orbiter, which can then be lowered down and attached via three struts protruding from the Boeing's fuselage. The linked vehicles will then take off the runway much like a normal airliner and fly up the Eastern seaboard to the Udvar-Hazy Center, a hangar-turned-museum near the Dulles International Airport. Before they land at the airport, however, the two are scheduled to take a twirl roughly 1,500 feet above major landmarks in Washington, D.C., so people on the ground can welcome Discovery. At the Dulles airport, the attachment process will be performed in reverse. Discovery will be demated from its ride and lifted into the air by a pair of giant cranes (there's no Mate-Demate gantry here). Then the Shuttle Carrier Aircraft will back out from beneath it. Once the jet is out of the way, the huge cranes will lower Discovery near the ground. Before settling it there, Discovery's landing gear wheels will be extended out from its underside, so it can touch down on the ground with them. From the airport, Discovery will roll on its wheels the short way to the adjacent Udvar-Hazy Center facility, where it will be installed in a place of honor.